The content on this website is provided for information purposes. Users must always refer to the relevant authority, regulation or act. 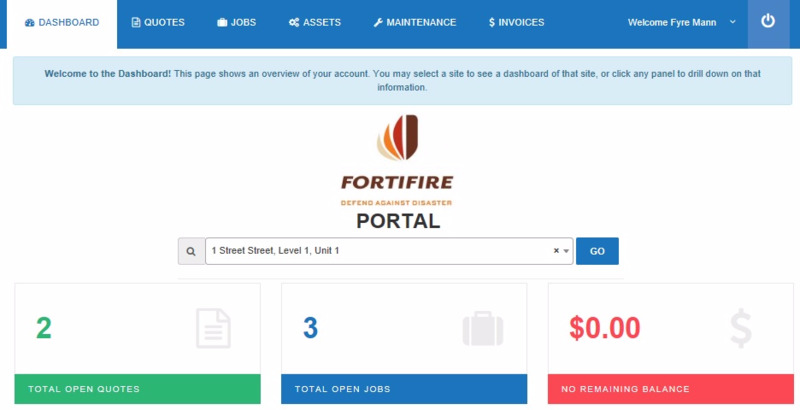 For the past three years, Fortifire has been working toward the implementation of a new Maintenance Management System that is aimed at introducing greater business efficiency and an even better customer experience. As our company continues to grow with increased staff, customers and customer assets to manage, it is important that Fortifire invests in new methods to help us maintain our high levels of customer service, reporting and compliance. We also need to improve the way we share information between our office and field technicians. As we further develop and enhance our system, we plan to continue adding other features in the future. The smoke alarm legislation will be introduced to ensure the State’s households are among the safest in the country. "Smoke alarm laws have been overhauled in a bid to prevent a repeat of the tragic Slacks Creek fire that claimed 11 lives,” Minister Ryan said. This new legislation is an investment in fire safety. It means people will be alerted to house fires as early as possible, giving them the best chance of survival. Under the new legislation, every Queensland residence will need to be fitted with photoelectric, interconnected smoke alarms in all bedrooms of the home as well as in hallways or between areas containing bedrooms. A 10-year phased rollout of the legislation would give Queenslanders time to ensure they had the right alarms and they were correctly located and installed. From 1 January 2017, all smoke alarm installations will need to be fully compliant for new buildings or when significant renovations occur. Private dwellings will be required to comply with the full smoke alarm requirements within 10 years and all houses leased or sold will need to meet compliance within five years. Any smoke alarm being replaced after 1 January, 2017 must be a photoelectric type alarm. “An interconnected alarm system means that if you are asleep it doesn’t matter what part of the house the fire starts in, the alarm in your room will alert you." Queensland Fire and Emergency Services (QFES) has worked closely with the State Government to develop the legislation. For more information about Smoke Alarms, take a look at Fortifire's Smoke Alarms Web Page, download our Smoke Alarms Information Bulletin or give us a ca or send an email. In light of recent media attention on Fire Fighting Foams, Fortifire takes this opportunity to confirm our Foam Concentrates are completely Fluorine Free. At the time of writing, we have been advised by our suppliers that the Foam Fire Extinguishers that we supply are the only Australian Standards approved Fluorine Free Foam Extinguisher. The Foam and Foam Concentrates that we use comply with the recent media release by the Queensland Government. If your organisation has any concerns about Foam Extinguishers or Foam Concentrate, please feel free to contact our office to see how Fortifire can help. Today the Queensland Minister for Environment and Heritage Protection and Minister for National Parks and the Great Barrier Reef, the Honourable Steven Miles has announced that Queensland will ban the use of all fire fighting foams containing PFOS and PFOA. This policy will "require that any existing stocks of foams containing PFOS and PFOA are withdrawn from service at commercial and industrial premises, and similar products phased out and replaced, as soon as practicable with more sustainable alternatives." Fire Protection Association Australia (FPA Australia) has previously voiced major concerns both with the lack of consultation and process for implementation of this policy. FPA Australia have supported improvements around the selection and use of firefighting foams in Australia and called for the immediate banning of foams containing PFOS. FPA Australia has also urged manufacturers to reduce and eliminate the production of long chain fluorinated foams containing PFOA in accordance with the US EPA PFOA Stewardship Program. However, significant issues exist surrounding the rollout of the ban that has been announced today. FPA Australia is deeply concerned by the Queensland Government view that potential environmental impacts alone should determine foam selection and use. In addition, the Association has real concerns about the lack of transitional mechanisms for existing users of now banned foams to move to the fluorine free alternatives. The Association believes that these legitimate issues have not been considered and, in the rush to take action on environmental concerns, the government has blindsided both producers and end users of these products in Australia. The Queensland Government has not engaged in any broad industry consultation to understand and balance the factors required to develop an informed policy position. Matthew Wright, Chief Technical Officer / Deputy CEO of FPA Australia said the ban was a simplistic response to a complex issue and potentially dangerous. "Environmental impacts must be a key consideration in the selection and use of firefighting foams, but this policy naively ignores the new generation of short chain ≤C6 fluorinated foams which are non-toxic and non bioaccumulative and simply draws an unrealistic line between fluorine free and fluorinated foams as the deciding factor for selection," he said. "Manufacturers of fluorine free and new generation of short chain ≤C6 fluorinated foam are members of our Association and have been committed to developing new foam solutions to transition away from traditional long chain fluorinated foams containing PFOS and PFOA for the express reason of improving environmental performance, but without compromising firefighting effectiveness and life safety." "If a foam is not effective for the hazard, the environmental impact will be magnified by the persistence and potential escalation of the fire event itself, damaging smoke, and potentially carcinogenic products and runoff regardless of whether the foam is fluorine free or not." It is clear that the use of Persistent Organic Pollutants (POP's) as identified by the UN Stockholm Convention are damaging to our environment and therefore their use should be restricted. FPA Australia contends that such restrictions must be risk based and holistically consider all risk factors. FPA Australia has seen no evidence that the Queensland Government has appropriately considered such factors holistically including firefighting performance, life safety, suitability for hazards, compatibility with existing systems and the financial impact of change for end users together with environmental risk. We have seen no Net Environmental Benefit Analysis supporting this position. The Association is now calling on the Queensland government to suspend implementation of this policy and work with industry to develop appropriate and cost effective transitional arrangements for suppliers and end users as we have suggested from the outset. In addition, we call on all governments considering these issues to participate in transparent and collaborative engagement with industry to ensure that all effective, compatible and environmentally sensitive foams available in the marketplace including fluorine free and new generation short chain ≤C6 fluorinated foams, can be used to better protect life, property and the environment. In support of 4TO FM (Townsville), Fortifire will be donating $50.00 to the Give Me 5 for Kids campaign for each new Customer who signs a Fire Safety Equipment Maintenance Agreement during June. Give Me Five for Kids is a fundraising initiative supported by over 40 radio & TV stations across regional Australia. For almost 20 years, the month of June has been dedicated to raising much needed funds for local community hospitals as well as sick children and their families when they need it most. The Queensland Fire and Emergency Services (QFES) are making changes in their response to alarm signals that reset in less than 10 seconds from alarm systems monitored by the QFES. This change only impacts premises monitored by the QFES. A QFES Communications Officer will in the first instance try to reach your premises, as per your nominated Emergency Contacts, to advise that an alarm has presented, but has reset within 10 seconds. The Fire Communications Officer will then advise that the QFES will not be attending the premises and that the Emergency Contact should confirm with any persons on site that the Emergency Warning System (or other building services) has not activated. Finally, the officer will advise that these contacts should engage the premises’ Fire Protection Company (Fire Technician). The Queensland Building and Construction Commission (QBCC) has recently reminded companies and individuals that fire protection for buildings is a serious matter and must only be undertaken by appropriately licensed entities. Entities undertaking fire protection work must ensure they have the required licences in place and that they contract and perform work in accordance with the QBCC rules and legislation. Those seeking to engage a contractor need to be vigilant and undertake reasonable due diligence in selecting their preferred services provider. NCC 2015 is provided as a preview of requirements that will be adopted by the States and Territories on 1 May 2015. The NCC is an initiative of the Council of Australian Governments (COAG) developed to incorporate all on-site building and plumbing requirements into a single code. The NCC sets the minimum requirements for the design, construction and performance of buildings throughout Australia. Fortifire continues it's proud association as official Sponsor for Townsville's Western Suburbs Rugby Union Club. We look forward to another safe and successful season in 2015. • Form 70 under MP 6.1 will be replaced with new Forms 71 and 72. The amendments to QDC MP 6.1 adopt the 2012 edition of Australian Standard (AS) 1851—Routine service of fire protection systems and equipment. A significant change in the 2012 edition of AS 1851 (compared to the 2005 edition previously referenced under MP 6.1) is reduced testing frequencies of certain fire safety features. It is intended the amendments to MP 6.1 will help achieve a reduction in red tape and provide savings for the fire safety maintenance industry and property owners/occupiers, while still protecting the safety of building occupants. • reducing testing costs for end users without reducing safety. QDC MP 6.1 applies to most buildings, other than class 1a and associated class 10 buildings, including existing older buildings. The new version of QDC MP 6.1 commences from 1 July 2014 and has a six month transition period. A six month transition period will apply during which QDC MP 6.1 will reference both the 2005 and 2012 editions of AS 1851. The transition period will apply from 1 July 2014 to 31 December 2014. From 1 January 2015, only AS 1851-2012 will apply under QDC MP 6.1. Fortifire will be working with existing and new customers during this period to ensure they are meeting their obligations under these requirements. A list of NCC 2014 amendments are available via the ABCB website. Please refer to www.abcb.gov.au for further details on these awareness‐raising initiatives. For a number of years now the BCA has required smoke alarms, or where appropriate, heat detection alarm systems throughout residential occupancies. The location of these alarms in strategic positions such as a hallway serving bedrooms is designed to allow an early response by occupants to a fire. be interconnected so that when one alarm is activated it will activate all other alarms in the occupancy. This feature will increase the likelihood of occupants being aware of the presence of a fire.  The life safety of building occupants, and particularly those in residential buildings (acknowledging the additional risks associated with being asleep), was considered to be of paramount importance.  The cost to the community of interconnecting alarms at the time of construction is not considered to be large.  Acknowledging that the RIS meets COAG guidelines, the Board was of the view that saving of a life through the interconnection of alarms represented a greater value to the community than that presented in the RIS. Internally illuminated “running man” exit signs are a common sight in many buildings where we live, work or play. In recent years, a number of other countries have permitted the use of photoluminescent (PL) exit signs under certain circumstances as an option to the more familiar internally illuminated exit signs. Photoluminescence is the ability of a material to absorb light and UV rays, and re‐emit visible light for a period after the source light has been removed. These signs have a unique ability to glow for long periods of time allowing for its potential use in the event of an emergency. Careful consideration was given to the applications in which these signs are used overseas and it was considered there was scope for their use in Australia provided that certain minimum specifications are met. As part of the new Deemed‐to‐Satisfy Provisions for PL signs a new specification has been included that sets out minimum illumination, luminance and duration for the performance of a PL sign. The specification also covers sign colour, borders, pictorial elements and viewing distances, and references ASTM E2073‐10 Standard Test Method for Photopic Luminance of Photo luminescent (Phosphorescent) Markings. Reducing regulatory burden and at the same time achieving better fire safety outcomes sounds like an impossible task. For a number of years concern has been expressed about the potential dangers associated with fire hose reels in Class 2, 3 and Class 4 parts of buildings. It is highly unlikely that an occupant who uses the fire hose reel in the event of a fire will be trained in its safe use. Also, water as an extinguishing medium can be a very dangerous mix with electrical or fat and oil fires that typically occur in residential occupancies, particularly when combined with the potential for the fire hose to prop open doors that form part of the building’s fire separating construction. Following consideration of these concerns and the commissioning of an assessment of the relative risks associated with fire hose reels and portable fire extinguisher used in residential occupancies, the requirement to provide fire hose reels in Class 2, 3 and Class 4 parts of buildings has been removed. In their place, additional installation requirements for portable fire extinguishers, including a requirement to cover Class A fire risks, has been introduced. Fortifire technicians undertake regular skills training. As part of our commitment to safety, we recently completed our six monthly CPR and Low Voltage Rescue training and we also completed our three yearly first aid course. In this photo, Campbell Yates is modelling our supreme bandaging skills. 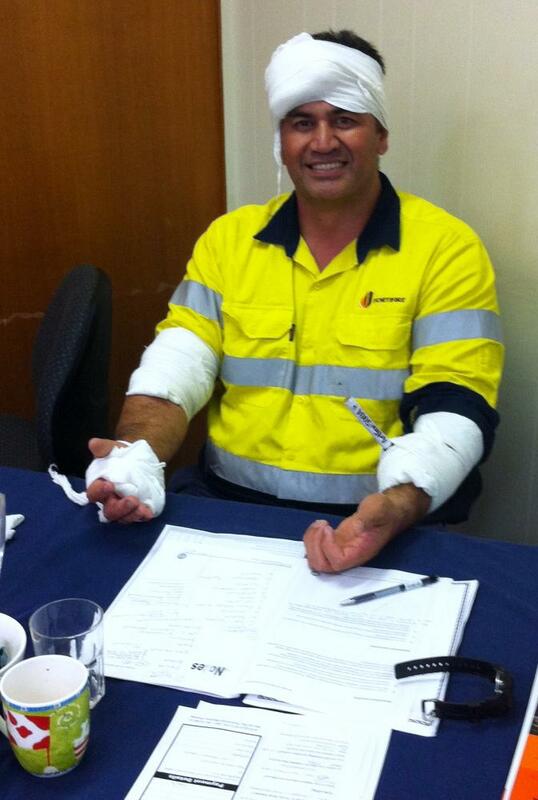 Thanks to John Le Roy and his team at One-on-One Professional Business Training in Townsville for a great day. Fortifire is proud to announce that we are the official Shorts Sponsor for Townsville's Western Suburbs Rugby Union Club. Our company logo will appear on all Junior and Senior Team shorts for seasons 2014 and 2015 in the Townsville & Districts Rugby Union competition. Fortifire wishes all teams the best of luck for a safe and successful season. Changes to the Electrical Safety Act 2002 and a new Electrical Safety Regulation 2013 will come into effect on 1 January 2014. New Codes of Practice will commence on 1 January 2014. On 1 January 2014 an amended Electrical Safety Act 2002 will come into effect. The amended Act will be available from the ESO website from 1 January 2014. Read the explanatory notes for the new Electrical Safety Regulation 2013. The amendments do not significantly change the requirements for electrical safety in Queensland. In addition, any 'person conducting a business or undertaking' will already be familiar with many of the changes that have been in use since the WHS Act commenced on 1 January 2012. On 1 December 2013 the Queensland Building and Construction Commission (QBCC) replaced the Queensland Building Services Authority as the building industry regulator for Queensland. The creation of the QBCC represents an important step in the most significant reform of the regulation of the building industry in more than 20 years. To reflect the sector’s position as a key driver of economic growth, and one of the largest employers in the state, the QBCC will be overseen by a professional governing board with extensive experience across a range of relevant sectors including law, finance and insurance as well as building and construction. A licence is still required to undertake building work and all licensees can continue to operate using their current BSA licence cards and a QBCC licence card will be issued at the next renewal date. So.....when will AS1851:2012 become mandatory in Queensland you ask. What we can tell you is Building Codes Queensland has this week forwarded draft minutes from a meeting with stakeholders regarding the proposed Queensland Development Code MP6.1 changes incorporating implementation of AS 1851 – 2012. · from 1 Jan 2015 the 2012 version is the only standard referenced under the MP 6.1 and the 2005 version will no longer be able to be used. A formal announcement of the official time-frames for adoption of AS1851:2012 in Queensland is expected early in 2014. From 14th Decemeber 2012, Electrical work in Queensland must comply with the minimum requirements of Australian Standard 3000 incorporating Amendment 2. Refer to the link below for more detailed information. The Queensland Electrical Safety Office has warned that several Christmas rope lights are being recalled by Woolworths Limited, Masters Home Improvement and Big W.
Refer to the link below for more information. - Before installing, check the condition of your equipment and replace broken bulbs with those specified by the manufacturer. - If you are not sure what you are doing, contact a licensed electrician. - Don’t overload power points and power boards and never "piggy-back" adaptors. - Only buy and use equipment that has Australian Standards approval and look for Energey Efficient devices. - Don’t use damaged or broken equipment, switches, power points, plugs or leads. - When installing outside, ensure equipment is appropriate and only use weather proof rated items. Use lighting products specifically designed for external use. Indoor lights are less durable and are not designed to cope with the weather in the same way as outdoor lights. - Keep electrical connections away from areas that may become wet. - If there is no safety switch fitted to your home, use a portable one at the supply. - Keep cables and cords clear of areas in the home where people walk, where vehicles travel and don't feed leads through windows and doors. - Use leads of appropriate length and don’t leave extension cords wound up when in use. - Keep tinsel away from power boards and wall sockets. Tinsel can be made of metal foil and can conduct electricity. - Turn your Christmas lights off when you’re not at home. - Don’t cover transformers with presents or decorations – this is a common cause of fires during the Christmas season. The use and adoption of the new AS 1851-2012 Standard across all jurisdictions in Australia is critical to establishing a nationally consistent approach to the maintenance of fire protection systems and equipment. This half day seminar will discuss the release of the new Standard and what this means for building owners, property professionals, fire protection companies and other key stakeholders. Each year, public awareness regarding fire risk in metro areas is usually highest in Winter when there are numerous campaigns and articles related to Heaters, Electric Blankets and Fire Places. In Summer, the general emphasis seems to be focued on Bush Fires and there is a concern that those who live in suburbia may become a little complacent. Just because you don't live on acreage or your home or business is not backing onto bushland, this is not an excuse to ignore fire safety. As daily temeratures climb, so to do operating temperatures and of plant and equipment, fridges and freezers, air conditioners, pumps and appliances. Are these items clean, functioning efficiently and in safe operating condition? Are leads and cables undamaged? Are vents clear of obstruction? Are filters clean? What about your BBQ? Are you firing it up for the first time after a winter break? Is the surrounding area clear? Could near-by vegetation be exposed to the BBQ? Is the LPG Cylinder, fixings and hoses clear and undamaged? How about your roof gutters....are they clear? Is your home or nusiness in danger of being at an increased risk if a neighbour has a fire? Some areas are already experiencing some record high temperatures and Summer is not yet here. As we draw closer to Decmber 1, take some time to look at your home and business and ensure you have taken steps to mitgate fire risks.